"Bullet" Bob Turley has run out of ammunition. 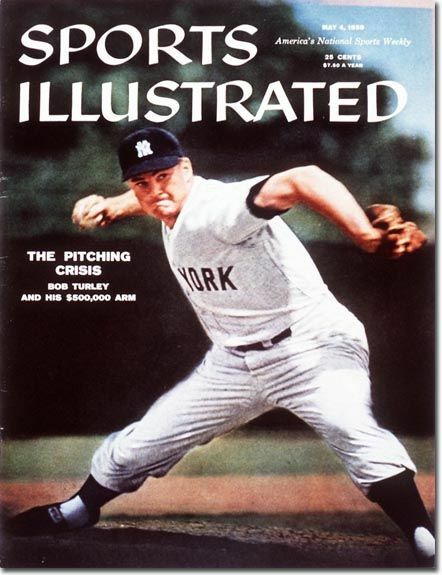 The 1958 Cy Young Award winner passed away Saturday evening from liver cancer in a hospice care center in Atlanta. He was 82. Turley broke in with the St. Louis Browns in 1951 before being drafted into the Army during the Korean War. He returned in 1953 and stayed with their franchise as they moved to Baltimore in 1954. The right-hander was given the ball for the Orioles first home game on April 15, 1954. Opposing Turley that day was Virgil Trucks of the Chicago White Sox, who also passed away earlier in the week. Turley pitched a complete game, striking out nine batters while surrendering only one run. "I’d be lying if I said I wasn’t nervous going out there," said Turley to the Baltimore Sun in 2009. "But I pitched the whole game. Had to. Back then, if you didn’t go nine, they sent you back to the minors." In their inaugural season, Turley led the team in wins and innings pitched, while his 185 strikeouts were enough to lead the American League. He won the team’s Most Popular Oriole award, which was done by fan voting. His prize was a brand new Cadillac. Author Gene Fehler told the story of Turley’s teammate Cal Abrams in “When Baseball Was Still King,” that the award wasn’t without some controversy. He spent the next eight years in pinstripes, winning two World Series championships in 1956 and 1958. The latter championship season was Turley’s marquee year. He won the Cy Young award in 1958, going 21-7 while pitching a league leading 19 complete games. He capped off the season with two victories in the World Series, earning the Most Valuable Player award in the process. He attributed his success that season to his endurance on the mound. Known for his fastball, Turley became more efficient as he matured as a pitcher. He realized that he didn’t need to strike out every batter he faced. Turley was sold to the Los Angeles Angels prior to the start of the 1963 season and split time with the Angels and the Boston Red Sox that year before retiring. In his post-baseball career, Turley made millions as the national sales director for Primerica Financial Services. He told Sports Illustrated in 2001 that the currency of playing for the Yankees advanced him in his entrepreneurial pursuits. In retirement, he remained a fan favorite, graciously obliging his fans when he returned for Yankees Old Timers Day. March 30th, perhaps? I'm hoping this was just a typo..